The Hill Crest in Khandala, Maharashtra, is a dreamy weekend retreat. It’s a home unlike what you see in an urban context, a home where space is no constraint, nature is an integral part of the experience and time seems to stand still. 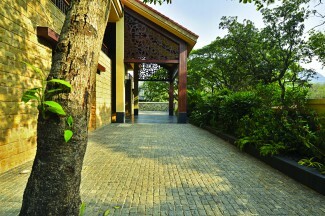 Mumbai and offers a simple laidback setting to unwind. Built by GA Design for a family of four, The Hill Crest is a perfect weekend home that breaks away from the cacophonous life of Mumbai and offers a simple laidback setting to unwind. 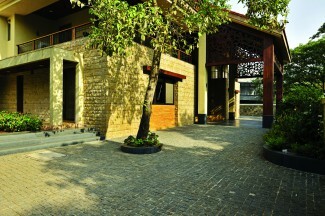 Spread over a plot area of 22,000 sq ft, the home is conceptualised as a tropical house with a semi-rustic feel. The enthralling experience of the house begins right at the front porch where fibre screens resembling wood create an amazing light and shadow sensorial experience. The porch leads into a foyer that makes way for the enormous living room. The ground floor comprises of the public spaces that include the living, dining, kitchen, dormitory and games’ rooms along with a guestroom. The master and child bedrooms are tucked away neatly on the first floor to achieve privacy. The architects wanted to create a simplistic plan with a visual transparency that would allow the residents to connect with the surroundings in a seamless way. Hence, spatial planning was done in a way such that it imbues a sense of openness and establishes an association with nature. Various stones employed in the rooms of the house have been handpicked to be water resistant and also to provide an exclusive experience in every space. 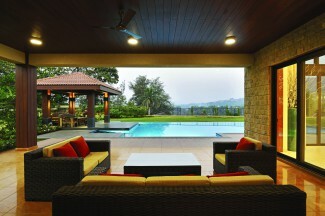 With the Khandala Valley on one side, the house has the obvious advantage of a brilliant view. Most rooms have been consciously designed to enjoy this view. The double-height living room, located centrally, creates a picture-perfect frame of the stunning vista of the Khandala valley. The passage on the first floor overlooks the living room as well as the lobby with a clear vision of the outside. The master and the child bedrooms, too, face the valley. GA Design imbibed local craftsmanship by using Rajasthani craftsmen for the master bedroom’s marble backdrop and local experts, adept at stone dressing and fixing, for the exterior Malad stone cladding. To allow the clients to soak in the valley view, the huge lawn at the rear end of the house is designed to be minimalistic. “The client was particular about seeing a nice expanse of greenery from the living room, and so we decided to have simple, flat green lawns,” explains Goregaoker. The garden area is visible from every location in the house, which makes one connect instantly with the beautiful natural vegetation all around. All corners of the house are designed with no columns, creating a sense of freedom. “It was a challenge to achieve a plan that was this simple. The client did not want anything that would be confusing for the mind. So, we kept an easy flow with a lot of circulation. Getting that simple plan to function well was definitely a lot of hard work,” shares Goregaoker. The painstaking effort to find different stones for different areas in the house, keep these materials rooted to the local context and create something interesting with them is clearly visible. Stones such as Jaisalmer, granite cobbles on the driveway flooring, flamed granite in the pool area and dressed Malad stone on the walls work brilliantly on the exteriors to create distinctive spaces. 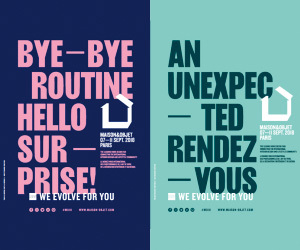 In the interiors, too, this story of personalisation continues. 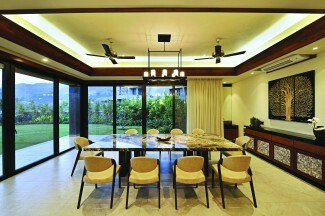 For example, the dining table is made with a single slab of exotic Brazilian granite. 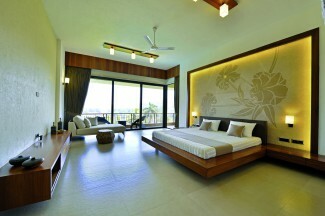 The master bedroom’s backdrop showcases an abstract flower design made of handcrafted and chiselled marble. 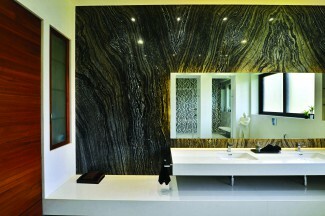 The built-in bed made of Travertino marble in the child’s bedroom and the textured marble finishes in the form of feature walls in the bathrooms add a unique dimension to the respective spaces. The luminescent swimming pool at the rear end of the house is the only ornamental addition; the house is otherwise designed with a minimal touch in order to showcase and highlight the beautiful valley view. Adapting green principles throughout the project, GA Design has used only sustainable materials that are moisture resistant and fungus proof, aligned to what the location needs. The wood used for the doors and furniture is old recycled wood and the walls are finished in a Bakelite polymer-based texture, eschewing POP. Fancy false ceilings have been avoided to minimise the chances of fungal formation during the rainy season. The Hill Crest lets nature dictate the planning of spaces and the use of materials. As Goregaoker says, “It’s all about the realisation that every material is actually coming from Mother Earth.” That honest surrender to nature defines this home-away-from-home.